This driver has received liposuction! 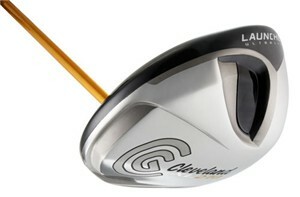 That's right; the good folks at Cleveland are taking more weight out of their 2011 drivers. The theory is: lighter is longer. Duhh! When was the last time you saw a beer-bellied couch potato outrun a ninety-pound Kenyan in a marathon? This XL270 gets its name from its svelte 270 grams of weight. This is 25 grams lighter than last year's Launcher DST. The secret of the driver's light weight is in its new fandangled Miyazaki shaft. This piece of technology is not only light but it's longer -- 46-1/4 inches, to be exact. I like the traditional head shape with the bigger, oversized head. It's teardrop shaped, not triangular or shaped like a jet wing. I also like the pop you get off of the face even if you catch it off of the toe. The ball flies just as far as center hits. High handicappers will appreciate the forgiveness while lower handicappers will appreciate the feel. Because most of the weight is taken out of the shaft, you can still get a good feel of the clubhead. However, I'm not a big fan of extra inches on the shaft. This adds another degree of difficulty for high handicappers.